Growing up, we pretty much never had biscuits. Until I was 13 or so, the only biscuits I had ever had were those that came in the exploding package, and so I didn't see what all the fuss was about. Then I discovered a biscuit recipe in one of my mom's cookbooks, and went nuts making biscuits right and left. They weren't perfect by any stretch (I had quite the tendency to mix everything to death) but they opened my eyes to what a good biscuit could be like. 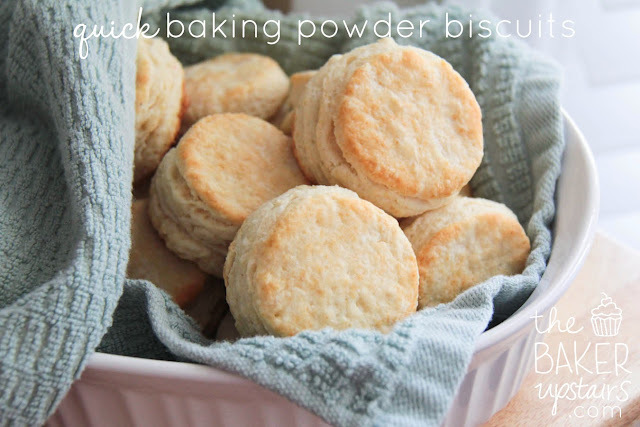 A few years ago I found this biscuit recipe and have made it over and over, and it's definitely one of my favorites. However, this morning I stumbled across a new recipe and had to make them immediately. The result? I think my buttermilk biscuits might have a little competition. I used the genius shaping method found at Under the Sycamore, and the biscuits turned out light and flaky and delicious. They're less sweet than the ones I usually make, too, which means that they're a little more versatile. The only changes I made were to use butter instead of shortening (it's my goal to never buy shortening again) and to cut out 15 biscuits instead of twelve (I couldn't find my 2 1/2 inch cutter). So delicious, easy, and quick! Heat oven to 450°F. In large bowl, mix flour, sugar, baking powder and salt. Cut in shortening, using pastry blender (or pulling 2 table knives through ingredients in opposite directions), until mixture looks like fine crumbs. Stir in milk until dough leaves side of bowl (dough will be soft and sticky). On lightly floured surface, gently roll dough in flour to coat. Knead lightly 10 times. Roll or pat 1/2 inch thick. Cut with floured 2 1/2-inch biscuit cutter. On ungreased cookie sheet, place biscuits about 1 inch apart for crusty sides, touching for soft sides. Bake 10 to 12 minutes or until golden brown. Immediately remove from cookie sheet to wire rack. Serve warm. Yes, I always substitute butter for shortening, because shortening is so gross. Sometimes butter can make cookies flatter (they spread more) in a recipe that calls for shortening, so I usually add an extra tablespoon or so of flour to balance it out. In something like biscuits, I think butter gives a much better flavor and texture!